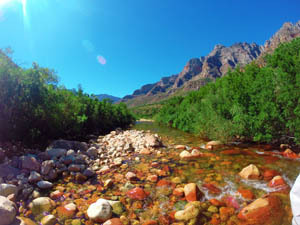 Lower down in the Du Toit’s Kloof valley, the Smalblaar river is known as the Molenaars. It consists of larger pools, wider runs and shallow pocket water. This is the last section before water extraction for the vineyards starts and the biggest fish – up to 20 inches - are routinely taken in this section. The Molenaars is an early summer beat. Most of its water is very shallow and heats up quickly in summer. When this happens, the fish are few and far between and the fishing can frustratingly difficult. The Molenaars beat is located on private land, and access to the stream for fishing purposes is strictly controlled by the Cape Piscatorial Society. Fishing must be booked via the CPS offices, at least a day in advance. The Molenaars may only be fished under strict guidelines, barbless hooks are mandatory, as is catch and release fishing. The CPS enforces a strict no take limit, and even injured fish must be returned to the ecosystem. Note: One can no longer book the full length of the old Molenaars beat, which has been divided in two. Molenaars Lower is the lower (downstream) half of the old Molenaars beat. The change will be effective from the 2014/2015 season, beginning on September 1st 2014. There is a close resemblance between Smalblaar beat 1 and the upper Molenaars beat. The pools are wide and shallow compared to the rest of the river and the water temperature is notably higher in summer, thus making the fishing a lot more testing than on other sections of the river. However, the average size of the fish on this beat will please you. The upper beat can be accessed by parking your car at the gate some five kilometers past the Du Toit's Kloof lodge traveling south towards Worcester along the N1. From here make your way via the path down to the river. The beat starts at the large rock covered with spray paint. From here fish upstream until the start of Smalblaar beat 1. The instructions will be available shortly. The lower Molenaars beat is seldom fished outside of the early season, as it marks the last stretch of survivable water for the trout on the river and warms up very quickly during the summer months. Fishing on this beat can be very demanding. During the early season larger terrestrial insect imitations work well but when the water thins out in the heat of summer, smaller CDC and parachute patterns fished of fine tippets become essential. Access to the lower beat is obtained by parking your car as if you were fishing the upper beat, and then walking down the N1 until a cable bridge can be seen over the river. From here make your way down the steep and slippery mountain side and through a farm fence. Continue down until you reach the river. From here fish up until the large spray painted rock which marks the start of the upper beat. Get out here and make your way up to the old farm road which you can follow back to your car. Access to the lower beat requires good fitness, and stable feet. Please don't try access this beat alone. 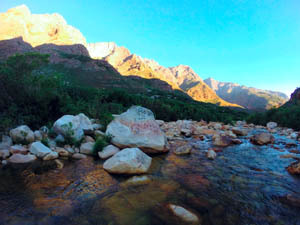 Traveling east from Cape Town, drive 8.5km from the exit of the Huguenot Tunnel on the N1 (4.5km from the Du Kloof Lodge). Past the lodge the road dips into a valley, as it begins to rise again be on the lookout for a side road on the left where you may park (Figure 1). Starts at the rapids above the pool under the swing bridge. The pool itself is NOT part of the beat. Ends about 1.3km from the start at the large, graffiti covered rock near where the footpath comes down to the river from the parking (Figure 5).